Black zip hoodie with front print only. The sizes do run a little small, I suggest you take one size larger if you're not after a slim fit :). S 53 cm / 21" 66 cm / 26"
M 57 cm / 22.5" 67 cm / 26.5"
L 60 cm / 23.5" 69 cm / 27.25"
XL 63.5 cm / 25" 71 cm / 28"
2XL 66.5 cm / 26.25" 73 cm / 28.75"
Perfect. The picture already looks amazing, but the Hoodie in real is more then amazing. 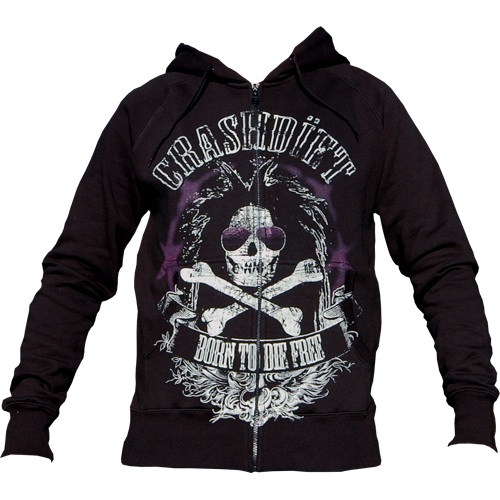 It's a perfect style for the next Crashdiet Tour. I love it. The quality of this hoodie is really good. I was surprised about that. I think that it going to last a long time. I also have to mention that it is really warm! I can recommend this to everyone and of course the design is just so great! This is literally the best hoodie I've ever had - and trust me, there have been many. I'm sure this will last more than few years, the material and printing are the best possible quality. It fits perfectly, it's warm and it definitely attracts a lot of attention! A big THANK YOU for this piece, guys!